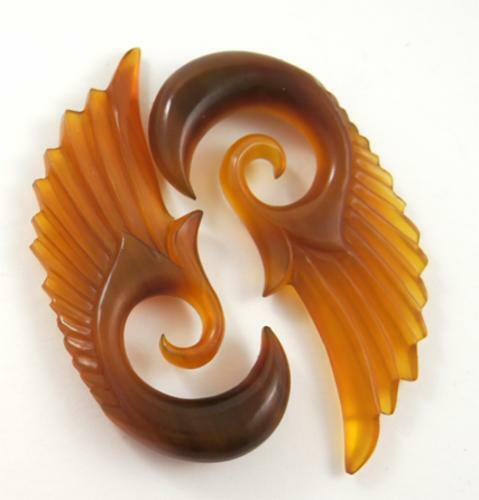 These striking tribal wing ear hangers are carved from semi-transluscent horn. The gauged earrings feature beautiful red and yellow hues. The feathers are more stylistic in nature and feature hard edges that start from the top of the earring and then follow the swirl down. The gauges are sold as a pair. While we typically try to keep most of the popular gauge sizes in stock if you don't see your gauge size listed please feel free to contact us or check back later as we're constantly restocking or adding new sizes and styles to our line.